Both the recent Fujifilm X-Pro2 and Sony A6300 demonstrate something that’s becoming more common in sensors: dual digital gain. 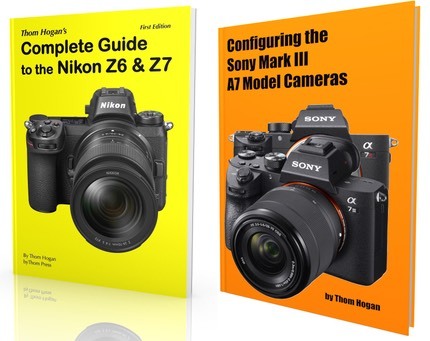 Of course, they both use variations of the same underlying 24mp APS sensor technology, so that these two cameras use dual gain isn’t a complete surprise. What’s dual gain, you ask? Well, first we have to describe “gain.” Caution: gross oversimplification ahead. In essence, digital sensors don’t actually have a varying response to light: they capture light the same no matter how you set the ISO. If the sensor captured 1000 photons at base ISO and converted them to electrons, the same thing happens at any other ISO you set: only 1000 photons were captured ;~). The ISO value you set, though, determines a switch in capacitance in the charge/volt conversion stage (gain) prior to reading out the data that is used in the sensor to reset the pixel values upwards in the bit values recorded. What dual gain systems do is change the gain value at some particular higher ISO value. Dual gain systems use one gain value with lower ISOs, another when higher ISO values are set. This dual gain approach was first realized by Aptina, then licensed from them by Sony. Photons are absorbed and create electron/hole pairs in the photo diode. Electrons are collected and a charge is stored. The charge determines the voltage for the storage node. The resulting voltage is fed to the analog-to-digital converter and we get a number to be recorded in the raw data (typically called a DN, or digital number). The ISO value you use will dictate a gain that’s applied to get the final DN. Dual gain sensors change what happens in Step 3 and 4. Essentially, starting at some ISO level the capacitance of the storage node is changed so that the final voltage is altered upwards in Step 3, and then in Step 4 you can apply a lower gain to generate the DN. Why do they do that? To reduce a component of read noise at higher ISO values, basically. The Fujifilm bumps gain at ISO 800, the Sony at ISO 400. But it’s probably the same point in the sensor ;~). Sony uses a base ISO of 100 for the sensor, Fujifilm 200. Why does Fujifilm use a higher ISO value than Sony? Essentially it provides Fujifilm the highlight headroom necessary to implement the "extended range" settings the X system claims to provide, at the penalty of producing a slightly noisier mid-tone than does the Sony implementation. So what’s the effective result of dual gain? Typically, an imaging sensor and ADC circuit that uses a single gain value has dynamic range performance that slides down at a constant rate as you bump ISO values. In the Fujifilm and Sony worlds, that tends to be a loss of about .8 stop of dynamic range per ISO bump. What dual gain does is reset that curve because it lowers the noise being introduced at the gain stage. So, for instance, the Fujifilm X-Pro2 seems to have the same dynamic range at ISO 800 as it does at 600 instead of an expected loss of about a third of a stop. From ISO 800, the slope of dynamic range loss resumes at the expected near one stop per ISO stop rate. The net effect, therefore, is that the high ISO values have about a third of a stop more useful dynamic range than they would have under the old single gain system. To see this in action, take a look at the graphs on Bill Claff’s Photons to Photos site. Bill’s calculations are one of the primary ways I double-check my own data, as I know his work to be impeccable. Update: corrected some errors that resulted from my over-simplification, added the source of the dual gain patent. Second Update: added the steps to show where dual gain occurs, and explain the reason for Fujifilm’s ISO change from Sony.